A Reconstructed Text of Pericles, Prince of Tyre. By William Shakespeare and George Wilkins. On the Basis of a Text Prepared by Gary Taylor and Macd. P. Jackson. Ed. Roger Warren (The Oxford Shakespeare). 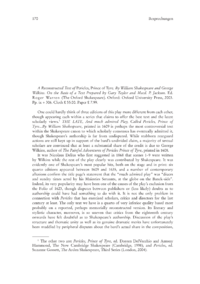 One could hardly think of three editions of this play more different from each other, though appearing each within a series that claims to offer the best text and the latest scholarly views. THE LATE, And much admired Play, Called Pericles, Prince of Tyre...By William Shakespeare, printed in 1609 is perhaps the most controversial text within the Shakespeare canon to which scholarly consensus has eventually admitted it, though Shakespeares authorship is far from undisputed. While stubborn rearguard actions are still kept up in support of the bards undivided claim, a majority of textual scholars are convinced that at least a substantial share of the credit is due to George Wilkins, author of The Painful Adventures of Pericles Prince of Tyre, printed in 1608.